Need help with your database? Do you want to get more out of your business software but don’t know where to start? Are you frustrated by a lack of meaningful information from ineffective reporting systems? ISG can help. Our experienced database design consultants will help you evaluate existing SQL Server, MySQL, Oracle, and MS Access database and create new relational databases designed to manage all of your important business data. Our database consulting team will analyze your business requirements, analyze and document use case scenarios, and help you design and implement a custom database solution tailored to the exact needs of your business and our database designers will normalize your database for optimum performance. At ISG we take database consulting seriously. We use the latest database development technologies including Linq, Dlinq, Xlinq, SubSonic, as well as traditional tools such as stored procedures and triggers to insure that our database applications are fast, accurate, and reliable and our consultants are heavily experienced in database architecture and performance tuning techniques. Define the requirements Quality database design and database application software development is predicated on an accurate definition of the business process requirements. Our database consultants understand business processes and will extract and document the details necessary to formulate a concise database design or software requirements document. This document will become the blueprint for your project and will also serve as a design artifact once your project is completed. It doesn’t matter if you are building a smart client desktop application, or the latest database driven web site, a clear requirements document is the first step in successful software development life cycle methodology for any qualified database consulting professional. Develop the use cases The project requirements document is intended to define the actual deliverables of the project but it does not contain enough detailed information to be used as a development guideline. To accomplish this goal, the business processes need to be broken down into individual tasks and the requirements and attributes of these tasks need to be defined. This is commonly done through a process called use cases. These use case requirements are gathered through individual or group sessions and are documented using software development tools such as UML (Unified Modeling Language) to become part of the overall system design. User interface designs including sample screens, etc. can also be part of this process. 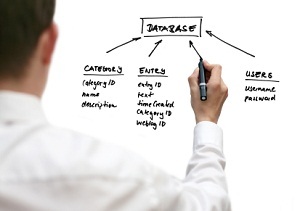 Design the database Once the requirements are known and the use cases defined, the database design consultant can begin the actual process of building the database model. This process often involves a database architect assembling all of the required data elements and then defining database tables based upon database normalization rules. Additional design elements include the analysis of appropriate key structures and identification of stored procedures and triggers required for optimal database performance and reliability. Build test requirements One might think that test plan definition might come after the creation of a development plan but in reality it should come first. Using the information defined in the requirements, use case, and database design processes, the database consultant can build a test plan of required activities. In addition to the obvious final testing, these activities will include component and unit test criteria necessary to identify dependencies required in the development plan. Create the development plan Now we know what the project requirements are, how the users interact with the identified requirements, what the necessary database looks like, and how the resulting product will be tested. Time to create the development plan which contains information on the technologies and development standards to be used, the components to be developed, the development steps to be executed, and the required sequence of the development events. Are you looking for an experienced web database consultant to assist with the design and development of an important new database driven website? Maybe you need eCommerce database consulting or web database development for your B2B or B2C eCommerce initiatives? Our database consultants will evaluate your web database requirements and create a professional database driven website design tailored to your eCommerce business needs and our database development team can build your custom database website using Microsoft SQL Server or MySQL and .NET application development technologies. Our web database solutions also include high performance database reporting and grid displays to allow for on screen sorting of displayed data, built in download management, administrative control panels, and automated database backup tools. Contact ISG today to see how our database programming consultants can improve the performance and functionality of your commercial web site. Contact ISG today to arrange for a database consulting or data warehouse consulting interview and to find out how our professional database consultants can help you build new database applications and improve the reliability and performance of your existing database applications.